KWCardDesign : Instead of Where's Waldo - its Where's Kari? Hi Kari! Thanks for stopping by my blog. The leaves stamps I used on my card are from Inkadinkado (The small ones around the sentiment), and the big one I used for the wet embossing on the outside of the card is from Studio 24 (found at Joann Fabrics). Thanks again for stoping by! Happy First Blogaversary, Kari! I came over from rwkrafts. I enjoyed looking through your creations and I particularly liked your bling challenge Christmas card. Hope you have lots of great crafting still to come! Happy blogaversary! What a generous giveaway you are having here. 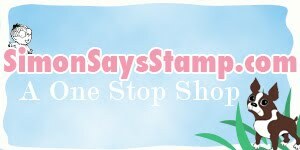 I appreciate the opportunity to win.... Simon Says Stamp is my FAVORITE online retailer! I am glad I came across your blog via the Lawnscaping challenge! It's always great meeting new blogger friends. I know I have created a monster but I think you have created one also with all the web sites that they have out there. You make some great cards and I appreciate all the ones you make for me. Thanks for being a great friend. Keep up the good work on your cards. great job on your cards!! I'm a new follower and have been a reader for awhile. Happy BlogAnniversary!